1.1. The importance of measuring age-related changes. 1.2. Distinguishing age-related changes pertinent to development and senescence. 1.3. Approaches to measuring age-related changes. 1.4. Using measurements of age-related changes to characterize factors that influence aging. 3.3. Are age-related degenerative changes specified by a genetic program or the result of the absence of a program for continued maintenance? Aging is characterized by progressive degenerative changes in tissue organization and function that increase the probability of mortality. Major goals of aging research include elucidating the series of events that cause degenerative changes and analyzing environmental and genetic factors that modulate these changes. The basis for mechanistic studies of aging are accurate and precise descriptions of age-related changes, since these descriptions define the aging phenotype. Here we review studies that describe age-related changes in C. elegans including measurements of integrated functions such as behavior, microscopic analyses of tissue organization, and biochemical studies of macromolecules. Genetic and environmental factors that influence these changes are described, and studies that analyze the relationships between different age-related changes are discussed. Together these studies provide fundamental insights into aging in C. elegans that may be relevant to aging in other animals. Aging is a fundamental aspect of animal biology that resonates deeply with people, because people experience their own aging and they witness others aging. Because aging is characterized by degenerative changes that progressively diminish function, people have a strong desire to understand aging so that it can be modified or delayed. Compared to many synthetic processes in biology that are known to be mediated by complex patterns of gene expression and intricate molecular machines, aging is not well characterized. The causes of aging and the potential plasticity of age-related degeneration are active research areas. While understanding human aging is an important goal, the experimental challenges of studying aging in humans or other vertebrates are substantial. By contrast, the free-living nematode C. elegans is a leading model system for studies of aging based on the identification of mutations, drugs, and environmental factors that extend the adult lifespan significantly. Mechanistic studies of how these factors influence aging are critical, and the foundation for these studies are measurements of age-related changes. Here we review the current understanding of age-related changes in C. elegans. This chapter is divided into three sections: a consideration of the approaches used to measure age-related changes, a description of the specific age-related changes that have been reported for C. elegans, and conclusions about aging that have emerged from these studies. The first section focuses on (1) why it is important to measure age-related changes; (2) which age-related changes should be measured; (3) how age-related changes are measured; (4) how these measurements can be used to understand genetic, environmental and pharmacological factors that influence aging; and (5) how these measurements can define the relationships between different age-related changes. The second section describes specific age-related changes that occur in C. elegans including behaviors mediated by the neuromuscular system, reproduction, tissue morphology, and biochemical properties. The third section highlights major conclusions from these studies including the significance of relationships between age-related changes, the relevance of these studies to theories of programmed and stochastic aging, and a new proposal for the evolution of reproductive aging. Measuring age-related changes is important for several reasons. First, these studies provide a description of normal aging in wild-type animals, and this description is the basis for the current understanding of aging. These descriptive studies have revealed that age-related changes are widespread, affecting many different tissues. Furthermore, age-related changes occur at all levels of biological organization. At the molecular level there are structural changes of macromolecules, such as DNA (Klass et al., 1983). At the level of integrated systems that require multiple tissues there are declines in function, such as diminished body movement and reproduction (Croll et al., 1977). There are also changes at levels between these two extremes, such as tissue morphology (Epstein et al., 1972). Second, the identification of specific age-related changes has been the source of hypotheses regarding the causes of aging. For example, the observation of age-related increases in oxidative damage to macromolecules such as proteins and nucleic acids supports the hypothesis that these structural changes are a cause of age-related functional declines (Balaban et al., 2005). Third, the measurement of age-related changes is a necessary starting point for studies that can define causal relationships during aging. The ultimate goal of aging research is to provide a comprehensive description of age-related changes that includes the causal relationships between the different changes. While measurements of age-related changes alone do not define these causal relationships, these measurements are an essential element of experiments that have the potential to define causal relationships. These experiments include the analysis of genetic, environmental, dietary and pharmacological factors that influence aging and longitudinal studies that define relationships between different age-related changes (Huang et al., 2004). Fourth, measurements of age-related changes can provide markers of aging. Such markers allow assessments of the extent of aging in live animals, they can be used to predict lifespan, and they can be used to evaluate short-lived strains for evidence of premature aging (Garigan et al., 2002; Gerstbrein et al., 2005; Huang et al., 2004). For these reasons, measurements of age-related changes are a critical component of every mechanistic aging study. Given that age-related changes are widespread, an important question is which age-related changes are the appropriate focus of aging studies? First, it is important to draw a distinction between age-related changes that represent development and growth and age-related changes that represent senescence. While several criteria are useful for distinguishing these changes, establishing definitions that precisely distinguish these two types of changes is challenging. One useful criteria is the point in the life cycle when the change occurs. Events in the embryo will typically be developmental, whereas changes in older adults will typically be aging. However, there is no time in midlife that clearly separates development from aging, and it is possible that developmental changes and aging changes occur simultaneously. For example, damage accumulation, which is typically considered an aging change, might begin in young animals that are undergoing development and growth. A second useful criteria is whether the age-related change increases organization and function (typical of development) or decreases organization and function (typical of aging). While this is a robust criteria, it is also not definitive. For example, older adults display an induction of stress response genes, which seems likely to be a functional response that improves survival. However, this is typically considered an aging change. By contrast, young hermaphrodites lose the ability to generate sperm when the gonad switches to egg production, but this change that results in a loss of functional capacity is typically considered development. A third criteria is the existence of a genetic program that specifies the change. Age-related developmental changes require a genetic program. If age-related degenerative changes also require a genetic program, then this criteria cannot distinguish development from aging. By contast, if aging changes do not require a genetic program, then this would be a distinguishing characteristic. As the relationships between genetic programs and age-related changes are better characterized, this criteria may become valuable. Although a consideration of these issues does not lead to a definition of age-related changes that represent aging, these criteria are useful and most studies focus on changes that occur late in adult life and diminish tissue function or organization. Any property of a biological system that can be measured can in principle be analyzed as a function of time during the animal's life stages. The first important issue is the time axis, and relevant considerations are the starting time, the ending time, and the number of intermediate times that are analyzed. For C. elegans, the starting times that are frequently selected are egg deposition, the emergence of the L1 larvae or the fourth larval stage, since these developmental stages can be accurately determined by morphological criteria. The simplest study involves measuring one time point. If two or more time points are analyzed, then it is possible to derive a graph of the property versus time. C. elegans studies frequently involve daily measurements until the end of life. For example, lifespan analysis typically involves daily assessments of whether the animal is alive or dead. The second important issue is whether the study has a cross-sectional or longitudinal study design. Longitudinal studies involve serial measurements of the same individual, and therefore the measurements must be noninvasive (except the final measurement, which can be invasive). Cross-sectional studies typically involve a single measurement of each individual. Cross-sectional studies are used for invasive measurements, such as electron microscopy, and for experiments that require combining multiple animals, such as gene expression analysis. Longitudinal studies provide opportunities for data analysis that are not possible with cross-sectional studies, and C. elegans is well suited to longitudinal studies because of the relatively short lifespan. The third important issue is the measurement itself. While in principle any measurable property of the animal can be analyzed as a function of time, in practice aging studies of C. elegans tend to focus on rhythmic behaviors, tissue appearance, and changes in biochemical properties. Each of these measurements is discussed in detail below. A general issue is the extent to which the measurement is quantitative. Some measurements are highly quantitative, such as the rate of pharyngeal pumping or the amount of a biochemical product. For highly quantitative measurements, it is possible to graph the quantity versus time. For measurements that are not highly quantitative, the typical approach is to establish categories. For example, vitality is not easily quantified, so animals are classified as alive or dead. Tissue organization is not easily quantified, so categories such as organized, partly disorganized and highly disorganized might be used (Chow et al., 2006; Garigan et al., 2002; Herndon et al., 2002). Sometimes numbers are assigned to these categories to allow the generation of summary statistics. However, because these numbers are assigned somewhat arbitrarily, this approach has significant limitations. A fourth important issue in analyzing these data is the generation of summary statistics for the purpose of making comparisons. Figure 1 shows the basic approaches that have been used to generate summary statistics. One approach is to analyze the pattern of the declining function. For example, the data can be fit to a straight line, and the slope of the line and the intercepts where the line crosses the X or Y-axis can be used as summary statistics (see Figure 1B; Bolanowski et al., 1981; Johnson, 1987). An important issue with the approach of fitting data to a straight line is that these data may fit better to another shape. A second approach is to predetermine a time and then compare the values (see Figure 1A). This approach is almost always used for studies of biochemical properties and tissue morphology, and is often used for studies of behavior. A third approach is to predetermine a transition point in the value, and then compare the times (see Figure 1C, D). This is the approach used for lifespan, where the predetermined transition point is alive to dead, and the typical summary statistic is the mean life span. This approach can also be used to analyze other transitions such as the transition from pharyngeal pumping to no pumping (Huang et al., 2004). Several transitions can be combined to represent stages of aging (see Figure 1E). In C. elegans, factors that have been demonstrated to influence aging include mutations, drugs, diet, and environmental conditions such as temperature. A major goal of aging research is to characterize the mechanisms that cause these factors to influence aging. One important approach to addressing these mechanisms of action is the analysis of how these factors affect age-related changes. A typical approach is to compare an age-related change in wild-type and mutant animals. If, for example, animals with a loss-of-function mutation display a delay of the age-related change, then it suggests that the gene activity causes an acceleration of that age-related change. This chapter highlights these results as each age-related change is discussed, and Table 3 summarizes age-related changes in several longevity mutants. A fundamental question is what are the relationships between different age-related changes? In principle, two age-related changes might be independent, they might share a common cause, or they might be linked in a causal series such that the first age-related change causes the second age-related change. This issue is particularly important for the age-related increase in the probability of mortality that is measured by lifespan; a major goal of aging research is to identify the age-related changes that contribute to the increasing probability of mortality. Thus, studies that distinguish age-related changes that are independent of survival probability from age-related changes that are correlated with survival probability are important. Several approaches can be used to experimentally address the relationship between two age-related changes. First, in some cases it is possible to use an experimental intervention to specifically modify one age-related change, and then measure the affect on the second age-related change. For example, a drug with antioxidant activity might be used to specifically delay age-related oxidative damage, and the effects on lifespan could be monitored. This approach is conceptually appealing, but in practice it is difficult to specifically affect age-related degenerative changes. A second approach is to characterize the correlation between two age-related changes. One method is to compare strains of worms that differ by genotype or environment. For example, Johnson (1987) analyzed multiple recombinant inbred strains and showed that strains with an extended lifespan also displayed an extended period of body movement (Johnson, 1987). The conclusion of this study is that two age-related changes are positively correlated. Another method is to use longitudinal studies to analyze variation within a genetically homogenous population. Huang et al. (2004) used this approach to show that animals with an extended period of pharyngeal pumping also displayed an extended period of body movement (Huang et al., 2004). The conclusion of this study is that these two age-related changes are positively correlated. This chapter highlights experimentally determined relationships as each age-related change is considered, and Table 2 summarizes the relationships between age-related changes that have been defined using these approaches. Figure 1. The analysis of measurements of age-related changes. 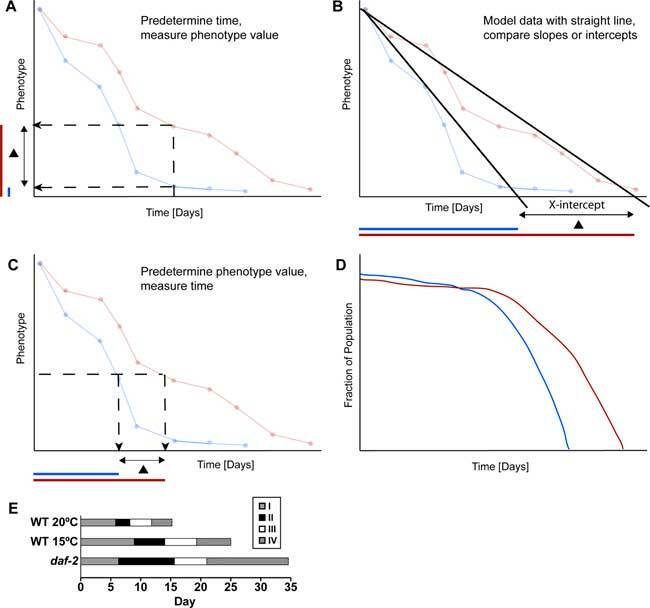 A comprehensive description of an age-related decline involves a large data set consisting of phenotypic values measured at many different times. These panels illustrate several approaches that are used to analyze these data sets. These approaches generate summary statistics that are used to compare age-related changes displayed by two groups of animals. The blue and red lines (A-D) are hypothetical examples of data sets generated by measuring a quantitative phenotype as a function of time for two groups of animals. The blue animals displayed a more rapid age-related decline than the red animals. (A) Blue and red animals were compared by determining the phenotypic value for each group of animals at one predetermined time. The typical summary statistic is the average phenotypic value at the predetermined time. Colored bars on the Y-axis illustrate the phenotypic value of the blue and red groups, and a black triangle represents the difference between these groups. The blue value is smaller, indicating a more rapid decline. (B) Blue and red animals were compared by modeling each data set with a straight line. One approach to comparing these lines is to compute the value of the X-intercept. As shown below, the X-intercept of the blue group occurred at an earlier time, indicating a more rapid decline. (C) Blue and red animals were compared by analyzing the time when each group transitioned to a predetermined phenotypic value. The typical summary statistic is the average span of time from the start of the experiment to the transition time. As shown below, the transition time of the blue group occurred at an earlier time, indicating a more rapid decline. (D) If a phenotypic value is predetermined as shown in panel C, then each animal can be classified as above or below that value. The fraction of animals above the value can be plotted. This is the standard approach for survival data, where the predetermined phenotypic value is alive (versus dead), and the typical summary statistic is the mean lifespan. In addition, this approach can be used for other binary phenotypes, such as fast body movement versus slow body movement. The graph shows that the fraction of animals above the predetermined value declines more rapidly in the blue group. (E) Stages of C. elegans aging as presented by Huang et al. (2004). This is a representation of four different age-related declines that were analyzed using the approach shown in panel D. Stage I is the period of self-fertile progeny production and is defined as the time from L4 to the end of the self-fertile reproductive span. Stage II is a post reproductive period characterized by vigorous motor activity and is defined as the time from the end of stage I to the end of the fast body movement span. Stage III is a period of reduced motor activity and is defined as the time from the end of stage II to the end of the pharyngeal pumping span. Stage IV is a period of minimal motor activity and is defined as the time from the end of stage III to the end of the lifespan. The bars show data from wild-type animals cultured at 20°C and 15°C and daf-2(e1370) animals cultured at 20°C. These bars represent average values for the self-fertile reproductive span, fast body movement span, pharyngeal pumping span and lifespan determined as shown in panel D.
The pharynx is a neuromuscular organ that undergoes rhythmic contractions that facilitate feeding; contractions can be counted using a dissecting microscope (Avery and Thomas, 1997). The pharyngeal pumping rate reaches a maximum of approximately 300 pumps per minute in two day old adults. Pharyngeal pumping undergoes an age-related decline and typically ceases about day 12 (see Table 1; Chow et al., 2006; Croll et al., 1977; Hosono et al., 1980; Huang et al., 2004). Longitudinal studies have been used to characterize the relationships between the decline in pharyngeal pumping and other age-related changes. Huang et al. (2004) used two measurements of the decline of pharyngeal pumping. Fast pharyngeal pumping was defined as >149 pumps/minute, and the time from L4 to the last day of fast pharyngeal pumping was called the fast pharyngeal pumping span. Slow pharyngeal pumping was defined as 6-149 pumps per minute, and the time from L4 to the last day of slow pharyngeal pumping was called the pharyngeal pumping span. These values can be determined for an individual or a population, and they measure an early and a late transition during the decline of pharyngeal pumping. A longitudinal study of wild-type hermaphrodites showed that the fast pharyngeal pumping span and the pharyngeal pumping span were strongly positively correlated, with a Spearman rank correlation value of 0.61 (Huang et al., 2004). This indicates that animals that undergo a more rapid loss of fast pharyngeal pumping will also undergo a more rapid loss of all pharyngeal pumping. Both the fast pharyngeal pumping span and the pharyngeal pumping span were positively correlated with the lifespan (0.49 and 0.83, respectively; see Table 2; Huang et al., 2004). These findings indicate that these measurements can be used to predict lifespan. In addition, the decline of pharyngeal pumping was positively correlated with the decline of body movement, as described in the next section (Hosono et al., 1980; Huang et al., 2004). See text for phenotypic descriptions. Symbols: “+” indicates a positive correlation; “none” indicates no correlation; “ND” not determined. In the case of a continuously declining function such as pharyngeal pumping, it is possible in principle to measure many different spans. The fast pharyngeal pumping span and the pharyngeal pumping span measured by Huang et al. (2004) are but two of many possibilities. An important question is how does the choice of a particular span measurement affect the results of the study? The finding that the fast pharyngeal pumping span and the pharyngeal pumping span demonstrated the same correlations indicates that, at least in the case of pharyngeal pumping, the selection of a particular span does not affect the results significantly. Mutations that affect lifespan have been analyzed for their effects on the decline of pharyngeal pumping. An insulin/insulin-like growth factor (IGF) signaling pathway has dramatic affects on adult lifespan (see Insulin signaling; Kenyon, 2005). Mutations that reduce the activity of the daf-2 gene, which encodes the Insulin/IGF-1 receptor, or the age-1 gene, which encodes a phosphatidylinositol-3-OH (PI3) kinase, cause significant extensions of adult lifespan. These genes act upstream of and negatively regulate daf-16, which encodes a forkhead transcription factor. Huang et al. (2004) showed that the decline in pharyngeal pumping is significantly delayed in daf-2 and age-1 mutants and accelerated in daf-16 mutants (see Table 3; Huang et al., 2004). These results indicate that the activity of the insulin/IGF signaling pathway accelerates the decline of pharyngeal pumping. clk-1 mutants display abnormal mitochondrial function and an extended lifespan (Ewbank et al., 1997; Lakowski and Hekimi, 1996). clk-1 mutants have a small extension of the pharyngeal pumping span, indicating that mitochondrial function accelerates the decline of pharyngeal pumping (see Table 3; Huang et al., 2004). eat-2 mutants have a reduced rate of pharyngeal pumping in young adults, resulting in dietary restriction and an extended lifespan (Lakowski and Hekimi, 1998). eat-2 mutants display an extended pharyngeal pumping span, indicating that dietary intake accelerates the decline of pharyngeal pumping (see Table 3; Huang et al., 2004). Each row represents an age-related change; see text for a description of these phenotypes. The last five columns describe the effects of loss-of-function mutations in the daf-2, age-1, daf-16, eat-2, and clk-1 genes; see text for references to studies that define the effects of mutations on age-related changes. Symbols: “D” indicates a delayed age-related change; “A” indicates an accelerated age-related change; “None” indicates no significant effect on the age-related change; no symbol indicates the effect has yet to be determined. An important question is whether using a muscular organ such as the pharynx promotes the age-related decline of organ function? Chow et al. (2006) addressed this issue by examining the age-related decline in pharyngeal pumping rate and the age-related change in pharyngeal tissue morphology in mutants with varying rates of pharyngeal pumping. eat-2 and daf-2 mutants that display reduced rates of pumping in young adults also display a delayed decline of pharyngeal structure and function. These results indicate that contraction-related injury may promote age-related changes in the pharynx (Chow et al., 2006). It is notable that these eat-2 and daf-2 mutations cause pleiotropic effects, including effects that result in lifespan extension, raising the possibility that the delayed decline of pharyngeal function in these mutants is caused by effects other than, or in addition to, the reduced rates of pumping. The well-coordinated sinusoidal body movement characteristic of young hermaphrodites becomes progressively slower and less coordinated and ultimately ceases altogether in old hermaphrodites (see Table 1). Two approaches have been used to measure body movement during aging. First, it is possible to quantify movement as waves per minute observed with a dissecting microscope (Bolanowski et al., 1981; Croll et al., 1977; Glenn et al., 2004; Johnson, 1987). Bolanowski et al. (1981) found that the wave frequency declines regularly with age and fit the data to a straight line. Second, it is possible to define categories of movement ability (Herndon et al., 2002; Hosono et al., 1980; Huang et al., 2004). Herndon et al. (2002) and Hosono et al. (1980) defined three categories: Class A (Herndon) or Type I (Hosono) animals progress with rhythmic sinusoidal movement, Class B (Herndon) or Type II (Hosono) are not active and are uncoordinated, and Class C (Herndon) or Type III (Hosono) are unable to progress but spontaneously move their head or tail and respond to touch (Herndon et al., 2002; Hosono et al., 1980). Huang et al. (2004) defined two categories: fast moving corresponding to Type I/Class A and not fast moving corresponding to type II/class B and type III/class C (Huang et al., 2004). The relationships between the decline of body movement and several other age-related changes have been characterized. Five studies have analyzed the relationship between the age-related change of body movement and the declining survival probability measured by lifespan. Hosono et al. (1980) and Herndon et al. (2002) showed that dividing wild-type animals into movement classes was predictive of lifespan (Herndon et al., 2002; Hosono et al., 1980). Huang et al. (2004) showed that the fast body movement span was positively correlated with lifespan in wild-type animals and several mutants. Johnson (1987) analyzed a series of recombinant inbred strains with differing lifespans, and the x-intercept of the age-related movement decline positively correlated with the maximum lifespan (Johnson, 1987). By contrast, Bolanowski et al. (1981) found no correlation between the rate of decline in movement frequency and the lifespan in a longitudinal study of wild-type animals (Bolanowski et al., 1981). Overall, these studies indicate that the decline in body movement is positively correlated with the decline in the survival probability and can be used to predict lifespan (see Table 2). The decline in body movement is also positively correlated with the decline in pharyngeal pumping. Hosono et al. (1980) showed that older adults that still displayed rhythmic, sinusoidal body movement (type 1) displayed more rapid pharyngeal pumping than animals of the same age that had diminished body movement and were unable to progress (type III), indicating a positive correlation between the declines in pharyngeal pumping and body movement (see Table 2; Hosono et al., 1980). Huang et al. (2004) showed that both the fast pharyngeal pumping span and the pharyngeal pumping span were positively correlated with the fast body movement span (Spearman rank correlation values of 0.69 and 0.48, respectively; see Table 2). The decline in body movement was positively correlated with sensitivity to the nematicidal effects of nile blue, a presumed measure of stress resistance (Hosono et al., 1980; Huang et al., 2004). The influence of genetic and environmental factors on the decline of body movement has been analyzed. Huang et al. (2004) showed that loss-of-function mutations in daf-2 and age-1 delay the movement decline, whereas a loss-of-function mutation of daf-16 accelerates the movement decline. Similarly, Murakami et al. (2005) showed that age-1(lf) delayed the decline in locomotion, and Glenn et al. (2004) showed that daf-2(lf) delayed the decline in spontaneous locomotion (Glenn et al., 2004; Murakami et al., 2005). Duhon and Johnson (1995) reported that age-1(lf) mutants have higher forward movement rates than wild type as young adults; the differences were not significant later in life (Duhon and Johnson, 1995). Thus, the activity of the insulin/IGF signaling pathway accelerates the body movement decline (see Table 3). An eat-2 mutation delayed the decline in the body movement, indicating that dietary intake accelerates this process (Huang et al., 2004). The analysis of body movement in dietary restricted animals may be complicated by the fact that foraging activity is regulated by dietary status, and dietary restricted animals may be more active in foraging and display higher levels of spontaneous activity. However, Huang et al. (2004) measured body movement of animals that were stimulated by agitating the Petri dish, and stimulated body movement is likely to be independent of dietary status. Rearing the animals at 15oC delayed the decline, indicating that warm temperature accelerates the decline (Huang et al., 2004). C. elegans hermaphrodites sense a variety of environmental cues such as chemical odorants and temperature. The assays for sensory perception typically involve exposure to a stimulus and measurement of a motor response. Hosono (1978) measured chemotaxis towards live E. coli and demonstrated an age-related decline in this behavior (Hosono, 1978). Glenn et al. (2004) showed that wild-type animals displayed progressive, age-related loss of the ability to chemotax towards an attractive odorant (see Table 1; Glenn et al., 2004). The decline in chemotaxis behavior was similar to the decline in spontaneous movement, indicating that the primary cause may be motor deficits. Consistent with this interpretation, day 2 and day 8 animals could both respond to gentle touch and the aversive odor octanol, but the motor response was diminished in day 8 animals (Glenn et al., 2004). The age-related declines in chemotaxis behavior and spontaneous locomotion were delayed in a daf-2(lf) mutant, indicating that the activity of the insulin/IGF signaling pathway accelerates this decline (see Table 3; Glenn et al., 2004). Isothermal tracking is an experience dependent behavior, in which C. elegans learn to associate paired-stimuli, food and temperature. Murakami et al. (2005) demonstrated that hermaphrodites display an age-related decline in isothermal tracking. About 80% of young adults display isothermal tracking, and this percentage declines until about day 15 when no animals display the behavior (see Table 1). The age-related decline in isothermal tracking is delayed by loss-of-function mutations in daf-2, age-1, clk-1 and eat-2, indicating that this decline is accelerated by the activity of insulin/IGF signaling, mitochondrial function and dietary intake (see Table 3; Murakami et al., 2005). Further analysis is necessary to establish the relative contributions of sensory and motor deficits to age-related declines in assays of sensory perception. The defecation cycle consists of a stereotyped series of muscular contractions that are coordinated by neural activity and culminate in expulsion (Avery and Thomas, 1997). The defecation cycle repeats approximately every 45 seconds in well-fed young adult hermaphrodites. Croll et al. (1977) observed that the mean interval between defecations increased rapidly between day 8 and 10 to about 130 seconds, and then plateaued. (Bolanowski et al., 1981; Croll et al., 1977). Bolanowski et al. (1981) described the age-related increase in the interval between defecations as multi-phasic, with a rapid change from day 3 to day 6, a plateau, and a gradual change from day 9 to day 14. The changes from days 3-6 and days 9-14 were observed in longitudinal studies of individual animals, and both changes are well represented by a straight line (see Table 1). A longitudinal study showed that the slopes of these lines (the rates of decline in defecation frequency) displayed no correlation with lifespan (see Table 2; Bolanowski et al., 1981). Thus, the rate of the defecation cycle appears to undergo an age-related decrease with a complex pattern. The declining defecation frequency as measured by slopes of lines fit to the data does not correlate with lifespan. The effects of the clk-1 gene on the age related increase in defecation cycle length was examined by Felkai et al. (1999). clk-1(qm30) mutants display an extended defecation cycle length in day 1 adults compared to wild-type hermaphrodites, whereas there is no significant difference in the day 4 adults. Overexpression of clk-1 results in a shorter defecation cycle length in day 4 adults. Therefore, a loss-of-function mutation of clk-1 and overexpression of wild-type clk-1 can reduce the rate of changes in defecation cycle frequency, suggesting that clk-1 activity influences this age-related change (Felkai et al., 1999). Successful reproduction is the ultimate goal of an organism. Therefore, the age-related decline of reproductive function is likely to be critical for the evolution of aging. Reproduction requires the germ line and somatic tissues, and it is important to understand how age-related changes in the reproductive tract and the somatic tissues affect reproductive function. It is notable that reproduction ceases relatively early in life: for wild-type hermaphrodites at 20oC, the self-fertile reproductive span is 5.8 days and the lifespan is 15.2 days (Huang et al., 2004). This suggests that the age-related decline in reproductive function may not be caused primarily by a decline in somatic functions that maintain survival. For self-fertile hermaphrodites the first approximately 300 germ cells differentiate as sperm, and the remaining germ cells differentiate as oocytes. Ward and Carrel (1979) showed that there is an age-related decrease in the number of sperm in or near the spermetheca (Ward and Carrel, 1979). This depletion of sperm corresponds with the fertilization of oocytes. Klass (1977) and Croll et al. (1977) documented that there is an age-related peak and decline in fertilized eggs laid that corresponds with the depletion of sperm (see Table 1; Croll et al., 1977; Klass, 1977). There is a delayed but overlapping peak of unfertilized eggs laid. These age-related changes are modulated by temperature, and the self-fertile reproductive span is extended by cold temperatures (Huang et al., 2004; Klass, 1977). The decline in fertilized eggs laid by self-fertile hermaphrodites is caused by the depletion of self-sperm, since mating to males can significantly increase the number of fertilized eggs laid (Hodgkin and Barnes, 1991; Ward and Carrel, 1979). The relationships between the age-related decline in self-fertile reproduction and other age-related changes have been analyzed. Johnson (1987) analyzed the length of the self-fertile reproductive period in many recombinant inbred lines and found no correlation with the mean lifespan of these lines (see Table 2; Johnson, 1987). Huang et al. (2004) conducted a longitudinal analysis of wild-type and mutant hermaphrodites, and there was no correlation between the self-fertile reproductive span and the lifespan, the fast body movement span, or the pharyngeal pumping span (see Table 2; Huang et al., 2004). The self-fertile reproductive span appears to be determined by the number of sperm that are generated, which is controlled by a developmental switch, and the rate of sperm utilization. The absence of correlations indicates that these processes are independent of the processes that influence the decline of body movement, pharyngeal pumping and survival probability. Mutations that influence lifespan have been analyzed for affects on the self-fertile reproductive span. Huang et al. (2004) showed that the insulin/IGF signaling pathway mutants daf-2(lf), age-1(lf), and daf-16(lf) had no significant effect on the self-fertile reproductive span (see Table 3). By contrast, several investigators have observed that some daf-2 mutations cause self-fertile hermaphrodites to deposit progeny at very late ages, indicating that these mutations delay sperm depletion (Gems et al., 1998; Larsen et al., 1995; Tissenbaum and Ruvkun, 1998). The tph-1 gene is necessary for serotonin synthesis, and loss-of-function tph-1 mutations cause an extended self-fertile reproductive span. This effect requires the daf-16 gene, indicating that tph-1 functions upstream of daf-16 to influence sperm depletion (Sze et al., 2000). The eat-2(lf) mutation that causes dietary restriction significantly extends the self-fertile reproductive span, and the clk-1(lf) mutation that reduces mitochondrial function causes a small extension (see Table 3; Huang et al., 2004). These mutations do not increase the number of self-fertile progeny, and thus are likely to decrease the rate of sperm utilization. Because self-fertile hermaphrodites completely deplete self sperm, measurements of live progeny production do not accurately measure the reproductive capacity of these hermaphrodites late in life. To address this issue, Hughes et al. (2007) analyzed mated hermaphrodites that have sufficient sperm. Compared to self-fertile hermaphrodites, mated hermaphrodites generate more progeny but still display an age-related decline in progeny production that results in the cessation of progeny production at about day 8. These studies demonstrate formally that hermaphrodites undergo an age-related decline of reproductive function that is independent of sperm depletion. To identify the factors that influence the age-related decline of progeny production in mated hermaphrodites, Hughes et al. (2007) analyzed temperature, early progeny production and drugs and mutations that extend lifespan. Early progeny production can be controlled by sperm availability in self-sterile mutants such as fog-2. Early progeny production did not significantly affect reproductive aging, indicating that using the germ line to generate progeny neither accelerates nor delays age-related degeneration. Cold temperature, an eat-2 mutation that results in dietary restriction, and a specific daf-2 mutation delayed reproductive aging. clk-1 and isp-1 mutations that affect mitochondrial function did not delay reproductive aging. The anticonvulsant medicine ethosuximide that extends lifespan delayed reproductive aging without reducing early progeny production. These studies identify factors that influence reproductive aging in mated hermaphrodites and demonstrate that hermaphrodites have the capacity for additional progeny production late in life. C. elegans adults display an age-related increase in size (Bolanowski et al., 1981; Croll et al., 1977). Croll et al. (1977) noted a progressive increase from day 3 to day 14 in length (about 70%), width (about 30%), and volume (about 280%). Bolanowski et al. (1981) noted an increase in volume from day 3 to day 9 (about 170%) with little further change (see Table 1). The age-related changes in size may be an example of programmed growth rather than a degenerative change, although the period of body growth overlaps with periods characterized by functional declines. Garigan et al. (2002) used Nomarski microscopy to analyze age-related changes in tissue appearance in the region of the head and pharynx. These changes include (1) a progressive lack of definition of nuclear boundaries; (2) progressive loss of the smooth and uniform appearance of the cytoplasm and nucleoplasm and the appearance of necrotic cavities and a curdled texture; (3) accumulation of shiny, mobile particles (likely to be yolk) and less mobile material (Garigan et al., 2002). Garigan et al. (2002) defined categories to describe the extent of deterioration (none, low, medium, high, and very high). A cross-sectional analysis showed that there is an age-related increase in the extent of deterioration (see Table 1). Furthermore, deterioration is delayed in daf-2(lf) mutants and accelerated in daf-16(lf) mutants (see Table 3; Garigan et al., 2002). Chow et al. (2006) used a similar approach to analyze age-related changes in pharynx morphology by categorizing Nomarski images based on the extent of deterioration (least, somewhat, or most). This analysis revealed an age-related increase in pharynx deterioration that was delayed in daf-2(lf) and eat-2(lf) mutants (see Table 3; Chow et al., 2006). Electron microscopy showed that the pharynx of older adults loses its smooth, rounded shape and has an irregular appearance (Herndon et al., 2002). C. elegans is typically cultured with live E. coli. There appears to be an age-related increase in the amount of bacteria in the pharynx and the anterior and posterior intestine (see Table 1; Chow et al., 2006; Garigan et al., 2002). Interestingly, treatments that reduce bacterial proliferation, such as U.V. light treatment and antibiotics, extend lifespan, indicating that live E. coli are pathogenic (Garigan et al., 2002). These interventions had a minimal effect on the decline of pharyngeal pumping, leading Chow et al. (2006) to conclude that bacterial accumulation is not a major contributor to this functional decline (Chow et al., 2006; Garigan et al., 2002). The analysis of Herndon et al. (2002) demonstrates that C. elegans undergoes sarcopenia, an age-related decline in muscle structure and function (see Table 1). One approach to visualizing muscle morphology is to express GFP in the nuclei of body wall muscle cells; there is an age-related change in nuclear GFP distribution characterized by a highly fragmented appearance (Herndon et al., 2002). The cell bodies of body wall muscles can be visualized by staining with phalloidin. Alternatively, GFP localized to the sarcomeres of the body wall muscles can be used to visualize muscle structure. These approaches reveal a progressive, age-related disorganization of sarcomeres with less dense packing and irregular orientation (Glenn et al., 2004; Herndon et al., 2002). Electron microscopy revealed multiple changes in sarcomeres including fewer myosin thick filaments, bent or broken thick filaments, shrunken cells due to cytoplasmic loss, and accumulation of lipid droplets (Herndon et al., 2002). The age-related decline of muscle morphology was delayed in an age-1(lf) mutant, indicating that the insulin/IGF signaling pathway accelerates this change (see Table 3). The disorganization of the body wall muscles was positively correlated with the decline in body movement (see Table 2; Herndon et al., 2002). In contrast to most other tissues, Herndon et al. (2002) detected little age-related change in neuronal morphology. GFP reporters that are expressed in neurons and allow visualization of neuronal cell bodies and processes displayed a similar appearance in young and old hermaphrodites. Similarly, electron microscopic analysis of neurons in old hermaphrodites revealed minimal age-related changes. Herndon et al. (2002) conclude that during C. elegans aging there is little if any neuronal cell death and no large-scale loss or restructuring of neurites or nuclei (Herndon et al., 2002). These findings suggest that the age-related declines in neuromuscular behaviours may not be caused by changes in neural function but rather are caused primarily by changes in muscle function. However, it remains possible that nervous system changes are significant at the molecular level but not detectable at the cellular level. The germ line viewed by Nomarski microscopy undergoes multiple age-related changes in appearance that are suggestive of deterioration: increased spacing of mitotic nuclei, nucleoplasm disrupted by cavities and grainy material, and nuclei that appeared to be cellularized (see Table 1; Garigan et al., 2002). Garigan et al. (2002) defined five categories of deterioration and used this scoring system to document a progressive, age-related deterioration of germ line morphology. Furthermore, daf-2(lf) and daf-16(lf) mutants undergo the same type of changes, but the timing of these changes is delayed or accelerated, respectively (see Table 3; Garigan et al., 2002). An age-related accumulation of fluorescent compounds has been observed in numerous animal species, indicating that this is an evolutionarily conserved aspect of aging (Yin, 1996). These fluorescent compounds include lipofuscin, a heterogeneous mixture of oxidized and cross-linked macromolecules, and advanced glycosylation end products, which result from sugar addition to free amino groups of proteins and subsequent cross-linking. Several techniques have been used to measure fluorescent compounds in C. elegans: (1) A fluorometer or luminescence spectrophotometer can be used to analyze aqueous homogenates or organic extracts of pooled worms (Braeckman et al., 2002a; Braeckman et al., 2002b; Davis et al., 1982; Hosokawa et al., 1994; Klass, 1977). (2) Spectrofluorimetry can be used measure a range of excitation-emission spectra in living animals (Gerstbrein et al., 2005). (3) fluorescence microscopy can be used to visualize autofluorescence in intact animals (Garigan et al., 2002). (4) Electron microscopy can be used to visualize pigmented granules that appear to contain fluorescent material (Epstein et al., 1972). These approaches have demonstrated that C. elegans hermaphrodites display an age-related accumulation of fluorescent material characterized by an excitation maximum of about 340nm and an emission maximum of about 430nm (see Table 1). These spectral properties resemble fluorescent spectra of lipofuscin and advanced glycosylation end products. The major location of these products are granules in the intestine (Garigan et al., 2002). However, the material is not restricted to the intestine. For example, Davis et al. (1982) demonstrated that detergent-cleaned cuticle preparations display an age-related increase in fluorescence that may represent changes in collagen. Gerstbrein et al. (2005) used spectrofluorimetry to analyze the relationship of age-related accumulation of fluorescent compounds to the age-related decline in body movement. In this longitudinal study, animals were divided into body movement classes and fluorescence was measured. Eleven-day-old Class C animals had significantly higher fluorescence levels than 11-day old Class A and B animals. Thus, there is a positive correlation between the decline in body movement and the accumulation of fluorescent material (see Table 2; Gerstbrein et al., 2005). Several longevity mutations have been examined for effects on the accumulation of fluorescent material. Loss of function mutations in age-1 and daf-2 that extend lifespan result in lower levels of fluorescence in young animals and a slower rate of accumulation (Garigan et al., 2002; Gerstbrein et al., 2005). By contrast, daf-16(lf) mutants display higher levels and accelerated accumulation, suggesting that these mutants are progeric (see Table 3; Gerstbrein et al., 2005). Overall these results suggest that high levels of insulin/IGF signaling accelerate accumulation of fluorescent material. Short-lived mev-1 mutants have been reported to display accelerated accumulation of fluorescence (Hosokawa et al., 1994) and lower levels of fluorescent material (Gerstbrein et al., 2005); the reason for this discrepancy is currently unknown. Dietary restriction delays the accumulation of fluorescent material. Mutations in eat-2 and unc-26 that reduce feeding and extend lifespan cause a dramatic reduction in the level of fluorescence and the rate of accumulation. Growth in liquid culture, which results in dietary restriction, causes a similar effect (Gerstbrein et al., 2005). Thus, dietary intake accelerates the age-related accumulation of fluorescent material. Klass et al. (1983) demonstrated multiple age-related changes in DNA (see Table 1). DNA extracted from pools of worms displays an age-related increase in the number of single-stand breaks. Furthermore, there is an age-related decline in the ability of DNA to function as a template for transcription in vitro (Klass et al., 1983). These age-related changes have not yet been characterized in mutants, and relationships with other age-related changes have not yet been defined. Whereas Klass et al. (1983) described an age-related increase in the levels of 5-methylcytosine, Simpson et al. (1986) conducted a sensitive analysis and failed to detect 5-methylcytosine in C. elegans during either development or senescence. Melov et al. (1995) used a PCR strategy to assess deletions in the mitochondrial genome. The frequency of deleted mitochondrial DNA increases with chronological age in four different populations of C. elegans. The age-1(hx542) strain displayed a lower rate of accumulation compared to wild type. Oxygen free radicals can cause damage to macromolecules, and this damage is proposed to cause age-related pathologies (Balaban et al., 2005). One specific measure of this damage is the level of protein carbonylation. Adachi et al. (1998) measured protein carbonylation per milligram of protein in extracts of pooled worms. In wild-type worms the levels of protein carbonylation increase about 3-fold from 4-8 days to 20 days (see Table 1). The rate of accumulation is affected by the insulin/IGF signaling pathway (Yasuda et al., 1999). The rate of accumulation is reduced by loss-of-function mutations in age-1 and daf-2 and increased by loss-of-function mutations in daf-16 (see Table 3). The rate of accumulation is accelerated in short-lived mev-1 mutants (Adachi et al., 1998). Furthermore, comparing several strains reveals a negative correlation between the level of protein carbonylation and the lifespan, suggesting that high levels of protein carbonylation may contribute to a shortened lifespan. In young adult hermaphrodites, yolk protein is found primarily in the intestine where it is synthesized and in late stage oocytes and embryos that accumulate it. Older hermaphrodites accumulate shiny, mobile patches of yolk protein in the body cavity (see Table 1; Garigan et al., 2002). Immunoelectron microscopy showed that yolk protein YP170 is distributed in electron dense lipid-like droplets and large accumulations throughout the body cavity of older hermaphrodites (Herndon et al., 2002). Similar observations have been made by visualizing GFP-tagged yolk protein. These studies suggest that the intestine continues to synthesize and secrete yolk protein after the time when oocyte production declines, resulting in accumulation of yolk protein in the body cavity. Herndon et al. (2002) suggest that yolk protein expression is left on in older hermaphrodites because there is little (if any) selective pressure to modify patterns of gene expression in post-reproductive animals. Interestingly, the accumulation of yolk protein is not delayed in age-1(lf) mutants (see Table 3; Herndon et al., 2002). Several measurements of metabolic activity have been demonstrated to display age-related changes (see Table 1). Carbon dioxide generation by populations of live worms grown on plates can be measured by gas respirometry. Carbon dioxide generation declines about 50% from day 6 to day 12 (Van Voorhies and Ward, 1999). Oxygen consumption of populations of live worms in liquid culture can be monitored polarographically using Clark type electrodes. Oxygen consumption of wild-type worms declines about 60% from adult day 0 to day 12 (Braeckman et al., 2002a; Braeckman et al., 2002b). Heat produced by populations of live worms can be monitored by microcalorimetry, and it is a measure of the rate of catabolic processes. Heat production of wild-type worms declines about 80% from adult day 0 to day 12. ATP levels, a measure of instantly available energy, can be monitored in worm extracts using enzyme reactions that require ATP. ATP levels decline about 80% from adult day 0 to day 12. The amount of superoxide anion, an estimate of the potential for metabolic activity, can be measured in worm extracts using lucigenin-mediated luminescence; this declines about 95% from adult day 0 to day 12. Vanfleteren and colleagues used these assays to monitor age-related changes in metabolic activity in mutants (see Table 3). Mutations of clk-1, clk-2, clk-3, gro-1, and daf-2 did not cause gross changes in these parameters, indicating that reduced energy metabolism does not cause the extended lifespan of these mutants (Braeckman et al., 2002a; Braeckman et al., 2002c). Mutations of age-1 and daf-2 did delay the age-related decline of lucigenin-mediated luminescence, indicating that the activity of the insulin/IGF signaling pathway promotes the age-related decline in metabolic activity (Vanfleteren et al., 1998). By contrast, Van Voorhies and Ward (1999) reported that the metabolic rate of age-1 and daf-2 mutants is reduced compared to wild-type animals, indicating that a reduced metabolic rate may cause the extended lifespan of these animals. The possible reasons for these divergent conclusions have been reviewed and are likely to reflect different growth conditions employed during the assays of live animals or different methods for measuring metabolic activity (Braeckman et al., 2002c; Van Voorhies, 2002). The activity of specific enzymes has been shown to display age-related changes. Protein tyrosine kinase activity in worm extracts decreases about 60% from day 5 to day 15 of adulthood (see Table 1; Vanfleteren et al., 1998). This decrease is significantly delayed by loss-of-function mutations of daf-2 and age-1, indicating that the activity of the insulin/IGF signaling pathway accelerates this age-related change. The activity of several acid hydrolases that are likely to be localized to lysosomes were examined in aging hermaphrodites by Bolanowski et al. (1983). β-N-Acetyl-D-glucosaminidase, β-glucosidase, α-mannosidase and acid hydrolase displayed age-related increases in activity. These changes are somewhat specific, since several other lysosomal enzymes did not display age-related changes in activity (Bolanowski et al., 1983). A variety of methods have been used to analyze age-related changes in the levels of specific mRNAs and proteins (see Gene expression changes associated with aging in C. elegans). Fabian and Johnson (1995a) examined the abundance of total RNA, rRNA and poly(A)+ RNA, but no consistent age-related trends were observed in these classes of RNA. Fabian and Johnson (1995b) did identify twelve specific transcripts that undergo a change in abundance over the adult life span. Cherkasova et al. (2000) used subtractive hybridization to compare gene expression in dauer and non-dauer (L3) larvae. Five genes with higher transcript levels in dauers also displayed an age-related increase in transcript levels. Whole-genome microarrays have been used to analyze age-related changes in gene expression (Golden and Melov, 2004; Lund et al., 2002). Lund et al. (2002) identified 164 genes that displayed statistically significant changes in transcript levels as aging occurs. Expression of some heat-shock proteins decreases, while expression of certain transposases increases. The functional significance of age-related changes in gene expression remains to be determined. Age-related changes in the responsiveness of gene expression to environmental stimuli have also been noted. The heat shock protein 16 (HSP-16) is induced to accumulate by heat stress. Walker et al. (2001) showed that there is an age-related decline in the levels of HSP-16 that can be induced by a heat stress, such that 16 day adults only accumulate HSP-16 to about 50% of the level of 4 day old adults. Loss-of-function mutants of age-1 accumulated higher levels of HSP-16 at all ages compared to wild-type animals, but age-1 mutants also displayed an age-related decline (Walker et al., 2001). One major accomplishment of the studies of age-related changes in C. elegans is the definition of relationships between different changes. Age-related changes in tissue morphology and function have been documented in many animals, but few studies have addressed the relationships between these changes. The experimental advantages of the C. elegans system have made it possible to address these issues using rigorous longitudinal studies. Table 2 summarizes the experimentally defined relationships. There is a strong, positive correlation between the declines of pharyngeal pumping, body movement and survival probability. Furthermore, there is a positive correlation between the decline of body movement and the appearance of disorganized body wall muscles and the accumulation of lipofuscin. These results suggest that these age-related changes may be causally connected. For example, the age-related disorganization of the body wall muscles may cause the decline in body movement. Alternatively, there may be a common mechanism that influences the timing of each of these processes. The declines of self-fertile reproduction and the defection cycle displayed no correlations with other age-related changes. One explanation for these results is that the lack of correlations occurred because the approaches used to measure these processes were not optimal. For example, the self-fertile reproductive span is probably not an accurate measure of the age-related decline in fertility, since self-fertile hermaphrodites cease progeny production as a result of sperm depletion. Overall, these results indicate that age-related changes in tissue morphology and function are controlled by common mechanisms and/or causally linked in series. A second major accomplishment of these studies is the extensive analysis of age-related changes in mutants that display an extended lifespan. These studies are important for elucidating the mechanisms that cause these mutations to delay aging. Table 3 summarizes this analysis of five genes that have been extensively characterized by many laboratories. Loss-of-function mutations of daf-2 and age-1 that reduce the activity of an insulin/IGF signaling pathway delay almost all of the age-related changes that have been reported, including the declines of neuromuscular behavior, tissue morphology and biochemical changes. By contrast, daf-16 loss-of-function mutations accelerate a broad range of age-related changes. These studies indicate the insulin/IGF signaling pathway does not affect selective aspects of aging but rather delays a wide spectrum of age-related changes. Similarly, the eat-2 mutation that results in dietary restriction delays a broad spectrum of behavioral, morphological and biochemical changes. These observations are similar to the results of studies of dietary restriction in rodents, which have demonstrated that caloric restriction delays many age-related changes (Masoro, 2005). These findings are consistent with the positive correlations between different age-related changes. It may be a general property that mutations which can extend the lifespan can also delay a broad spectrum of age-related changes. A critical conceptual issue in the aging field is the role of genetic programs in controlling age-related degenerative changes. Here we discuss how the analysis of C. elegans contributes to understanding this issue by considering two theories. The first theory is that age-related degenerative changes are specified by a genetic program. The second theory is that age-related degenerative changes are caused by the absence of genetically encoded instructions that permit continued maintenance and organismal survival. According to the first theory, age-related degenerative changes should be relatively reproducible, similar to age-related developmental changes, since both types of events are genetically specified. Furthermore, it should be possible to identify mutants that do not undergo specific age-related degenerative changes, by mutating genes that specify these changes. According to the second theory, age-related degenerative changes should be relatively chaotic and less reproducible than developmental changes. Futhermore, it should not be possible to identify mutants that do not undergo specific age-related changes, since these changes are not specified by a genetic program. First we will consider the degree to which age-related changes are reproducible versus chaotic and stochastic. This review has emphasized the reproducible aspects of age-related degenerative changes, including the finding that most changes become progressively more severe and that most changes occur over a characteristic time span. For example, reproduction typically ceases before pharyngeal pumping ceases. On the other hand, Herndon et al. (2002) concluded that the pattern of age-related changes suggests that these changes are mediated by stochastic events. The evidence that age-related changes are mediated by stochastic events is the degree of variability displayed by aging animals. For example, in a group of animals that are the same chronological age, there can be wide variation in the ability to perform a function such as body movement. In addition, at the cellular level, Herndon et al. (2002) noted that there is substantial variability in degenerative changes. For example, examining a pair of cells that are left-right symmetrical might reveal that the left cell was extensively degenerated whereas the right cell was intact. These studies convincingly document the degree of variability of aging changes. However, developmental events that are programmed display some variability. While it appears that age-related changes at the cellular level are more variable than developmental events, the amount of this extra variability has not been defined and it is difficult to quantify variability. Despite these caveats, the observation that age-related degenerative changes are highly variable and likely to be mediated by stochastic processes is a significant discovery that suggests age-related changes result from the absence of a genetic program. Second, we consider how C. elegans mutations that influence aging address these two theories. A large number of mutations have been identified that extend C. elegans lifespan. These mutations typically delay age-related degenerative changes, but they typically do not affect the nature of these changes. In other words, long-lived mutants and wild-type animals display very similar age-related changes, the major difference being the delayed timing of these changes in the mutants. Mutants that fail to undergo specific age-related changes have not been well described. Thus, the genes that influence lifespan appear to control processes that determine the rate of age-related degenerative changes and do not appear to specify the nature of the age-related degenerative changes. We interpret these findings as most consistent with the theory that age-related degenerative changes are not specified by a genetic program, but rather result from the absence of a genetic program for continued maintenance. The evolution of aging is an important topic, and studies of reproductive aging in C. elegans have led to a new theory to explain this phenomenon. The reproductive history of a C. elegans hermaphrodite involves (1) the initiation of progeny production as a result of sexual maturity, (2) some level of progeny production during the fertile period, and (3) the cessation of progeny production as a result of reproductive aging. These three processes determine the rate of progeny production and the total number of progeny generated by an individual. Because successful reproduction is the ultimate purpose of animal life, it is likely that all three processes are sculpted by natural selection during evolution. Thus, understanding reproductive aging is likely to provide critical insights into the evolution of aging. If reproductive aging were delayed, then an animal would be predicted to generate more progeny. Because aging in general and reproductive aging in particular appear to decrease progeny production, these traits have been a subject of debate for evolutionary theorists. The modern theory of the evolution of aging was proposed by Medawar and postulates that extrinsic mortality is the cause of the evolution of aging because it results in an age-related decline in the force of natural selection (Medawar, 1952). This theory proposes that natural selection cannot favor traits that extend longevity beyond the time when most individuals have died as a result of extrinsic mortality. Williams elaboration of this basic idea, the antagonistic pleiotropy theory, postulates that traits that promote early reproduction at the cost of diminishing late reproduction will be favored by natural selection (Williams, 1957). This theory proposes that tradeoffs exist between early and late reproduction and selection for enhanced early reproduction is the cause of aging. These theories assume that reproductive aging confers a selective disadvantage because it decreases progeny production. An alternative assumption is that progeny production is advantageous initially but at some point continued progeny production confers a selective disadvantage; based on this assumption, reproductive aging confers a selective advantage because it halts progeny production. The results of Hughes et al. (2007) address the relationships between early progeny production and reproductive aging and are relevant to predictions of the antagonistic pleiotropy theory. The antagonistic pleiotropy theory predicts that increased progeny production late in the reproductive period should be accompanied by decreased progeny production early in the reproductive period (Williams, 1957). Hughes et al. (2007) demonstrated that cold temperature, dietary restriction, and a specific daf-2(lf) mutation increase late reproduction and decrease early reproduction, consistent with this prediction of the theory. By contrast, an anticonvulsant drug increases late reproduction but does not decrease early reproduction, and this is not consistent with this prediction of the theory. Overall, these results suggest that there is no consistent relationship between early progeny production and late progeny production. Therefore, selection during evolution for high levels of early reproduction may not be a cause of reproductive aging in C. elegans. Hughes et al. (2007) propose an alternative hypothesis for the evolution of reproductive aging. Namely, that selection for an optimal number of progeny may determine the timing of reproductive aging. Two important observations support this proposal. First, C. elegans hermaphrodites that are not sperm limited undergo a complete cessation of progeny production as a result of reproductive aging before the end of the lifespan. These findings suggest that age-related degeneration of somatic systems that support life may not limit reproduction, but rather the reproductive system is engineered to fail before the soma fails. Second, C. elegans hermaphrodites have the capacity to generate a larger number of total progeny and a larger number of progeny later in life, and these capacities are not normally utilized (Hughes et al., 2007). Together, these findings indicate that C. elegans is not engineered to generate the maximum possible number of progeny. Hughes et al. (2007) propose that there is an optimal number of F1 progeny, and reproductive aging contributes to the ability of the animal to generate the optimal progeny number. If a species encounters selective pressure for an increase in progeny number, then delayed reproductive aging may evolve. If a species encounters selective pressure for a decrease in progeny number, then accelerated reproductive aging may evolve. According to this theory, environmental factors that establish the optimal progeny number will be critical for the evolution of reproductive aging. Limiting progeny production to an optimal number might act at two levels to maximize reproductive success. At the level of the individual, generating the optimal progeny number may limit competition for resources among the progeny and maximize the probability that the optimal number of F1 progeny mature to become reproductive adults. At the level of the population, generating the optimal progeny number may help to achieve the maximum sustainable number of animals in the population and avoid oscillations in the number of animals in the population that might increase vulnerability to extinction. According to this proposal, selection for the optimal progeny number establishes the timing of reproductive aging. Once reproduction has ceased, there will be no selective advantage for continued survival of the soma, and somatic aging could result from this absence of selection for continued somatic maintenance. The authors are grateful to the National Science Foundation, the Longer Life Foundation, and the Ellison Medical Foundation for support. Adachi, H., Fujiwara, Y., and Ishii, N. (1998). Effects of oxygen on protein carbonyl and aging in Caenorhabditis elegans mutants with long (age-1) and short (mev-1) life spans. J. Gerontol. A Biol. Sci. Med. Sci. 53, B240–B244. Avery, L., and Thomas, J.H. (1997). Feeding and Defecation. In: C. elegans II, D.L. Riddle, T. Blumenthal, B.J. Meyer, J.R. Priess, eds. (Cold Spring Harbor Press), pp. 679–716. Epstein, J., Himmelhoch, S., and Gershon, D. (1972). Studies on ageing in nematodes III. Electronmicroscopical studies on age-associated cellular damage. Mech. Ageing Dev. 1, 245–255. Medawar, P.B. (1952). An unsolved problem of biology. H.K. Lewis & Co., London. *Edited by Monica Driscoll and Garth Patterson. Last revised January 25, 2007. Published December 7, 2007. This chapter should be cited as: Collins, J.J., et al. The measurement and analysis of age-related changes in Caenorhabditis elegans (December 7, 2007), WormBook, ed. The C. elegans Research Community, WormBook, doi/10.1895/wormbook.1.137.1, http://www.wormbook.org. Copyright: © 2007 James J. Collins et al. This is an open-access article distributed under the terms of the Creative Commons Attribution License, which permits unrestricted use, distribution, and reproduction in any medium, provided the original author and source are credited.